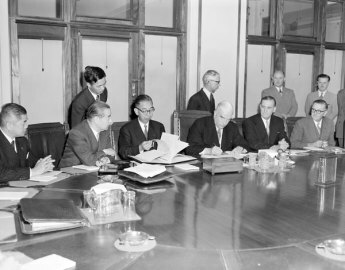 Sixty years ago, on 6 July 1957, a remarkable event transpired in Hakone, Japan: an Agreement on Commerce was signed by Australia and Japan. It was remarkable because the Pacific War and Japan’s aerial bombardment of Darwin, Broome, Townsville and other places, and wider crimes against humanity, were still fresh in the memories of Australians. No other country among the Allies entered into a bilateral trade agreement with Japan so soon after the war. The Agreement conferred ‘most-favoured nation’ status on Japan in tariffs, and promised non-discriminatory treatment in import and exchange controls. The Menzies government showed foresight in entering into the Agreement. Menzies is often regarded as ‘British to the bootstraps’ but he was aware of the need to adapt to changes in the post-war world. The Agreement was not, however, without political opposition. Debate in parliament went for six days. Labor leader, Dr H V Evatt, felt that it lacked adequate safeguards for Australian industry and was a form of ‘economic aggression’. He was supported by local manufacturers, trade union leaders and Labor MPs who feared competition from Japanese imports. Eddie Ward MP described the Agreement as a ‘criminal action against the Australian nation’. It was understandable that the Agreement would be controversial after the war but the bigger pressures were overwhelming. First, there was the reality of Britain becoming less important to Australia as a destination for our exports. John McEwen, the leader of the Country Party who signed the Agreement for Australia, was acutely aware of this and regarded Japan as the only other comparable market. He was proven right. Japan’s industrial expansion and growing prosperity gobbled up Australian wool, coal and copper and by 1967, Japan was the main importer of Australian goods – overtaking the United Kingdom. Another overwhelming factor was the Cold War. Japan was defeated by the Allied powers in 1945 and under American-led occupation was no longer an imperial power. The occupiers allowed Japan to retain the Emperor, Hirohito, on condition that he renounced any claim to divinity and supported a new constitution – one that was democratic and pacifist. When the Korean War commenced in 1950, Japan was used as a military base by the anti-communist forces led by the US. Japan was on the American side. The San Francisco Peace Treaty of 1951 involved 48 nations and restored sovereignty to Japan. Australia was a signatory and, following the Treaty’s implementation in 1952, Australia opened an embassy in Tokyo. Japan established one in Australia the following year. 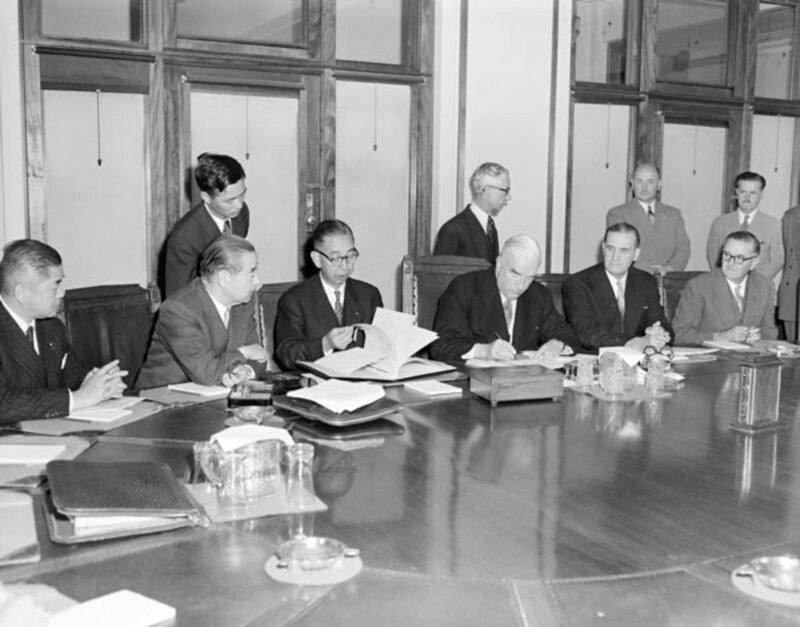 In the lead-up to the Commerce Agreement, Menzies visited Japan in April 1957. He was the first Australian prime minister to make an official visit. Japan’s prime minister, Nobusuke Kishi, visited Australia later in the year – another ‘first’. Relations between the two countries were becoming normalised, despite lingering anti-Japanese sentiment in public opinion. Menzies was awarded Japan’s Order of the Rising Sun in 1975. This was not a first for a former prime minister, though, as Edmund Barton had received it in 1905. John McEwen was also admitted into the Order, and many years later it was conferred on Gough Whitlam, Malcolm Fraser, Bob Hawke and John Howard. The 1957 Agreement can be seen as the catalyst for the development of a trade relationship that blossomed and extended into many spheres, ranging from fisheries and culture to regional security. In 1976, another step forward was taken through the Basic Treaty of Friendship and in 1997 the Japan-Australia Partnership Agenda was adopted. Then, in 2014, after seven years of negotiations, Prime Minister Tony Abbott announced that agreement had been reached on a Japan-Australia Economic Partnership which he said was ‘the first time that Japan has negotiated a comprehensive economic partnership agreement or free trade agreement with a major economy, particularly a major economy with a strong agricultural sector’. Today, 60 years on, Japan is Australia’s second-largest trading partner and second-largest export market (after China). Two-way trade in goods and services between Australia and Japan was valued at $59.9 billion in 2015–16. Goods exports to Japan in 2015–16 were $40.1 billion, representing approximately 16 per cent of Australia's total goods exports. Principal exports were liquefied natural gas, coal, iron ore, beef and copper. Australia is among the nations that have moved away from protectionism. In doing this, successive Australian governments have helped create a more integrated regional and global economy and expanded opportunities for bringing people closer together. Arguably, ‘globalism’ can also help promote democratic values, while stimulating growth and making economies more flexible and dynamic. The Japanese Prime Minister, Nobusuke Kishi, with his Australian counterpart Robert Menzies and Trade Minister John McEwen, December 1957. Kishe’s grandson, Shinzo Abe, is the present Japanese Prime Minister. Image: National Archives of Australia.